Of all of the countries of Europe, the British Isles are most exposed to the varying weather from the mobile westerly air flow off of the North Atlantic. While blessed with mild winters, the dampness, cool summers and meteorological exposure to the westerlies has lead to the pronouncement that the Isles have "no climate, only weather." Historically, Britain has appealed more to invading northern peoples rather than those from the south. The former found the warm moist climate an improvement on their homelands, while to the latter, especially the French, it appeared illogical to covet such a cloudy, damp and windy land (Manley, 1970). While good for the "English lawn," the damp gray skies will not find favor at eclipse time. But fairness dictates that we note the eclipse comes at the height of summer over the sunniest parts of the English countryside. Land's End and the south coast of England offer the best prospects for sunshine anywhere in the Isles, and so by good fortune the eclipse track is located to its best advantage. The upper air currents which carry the weather systems onto the islands are predominantly westerly. The main track of invading low pressure centers is north of Scotland, but trailing cold fronts frequently drag across England as these disturbances pass, bringing persistent cloudiness and precipitation. The cooler, drier high pressure systems following these fronts do not always improve sky conditions, as the colder airmass is often unstable and speckles the afternoon landscape with showers or thundershowers. Periodic blocking patterns occasionally interrupt the alternating stream of highs and lows, bringing episodes of stable unchanging weather. This interruption in the variable weather pattern may or may not favor the eclipse observer depending on where the block develops. If the circulation over the islands is anticyclonic, as when a high builds northward from the Azores anticyclone or takes up residence over western France, then sunny dry weather will dominate, likely for several days. However, when cyclonic circulations settle in, especially if the low center lingers over England, dull gray skies will dominate. Long term studies suggest that a variable westerly flow can be found about 28% of the time, cyclonic blocking for 24% and anticyclonic patterns for 23%. Suitable eclipse-viewing weather will be found during anticyclonic days and possibly in the wake of cold fronts during the changeable westerly weather. In the wake of a cold frontal passage, coastal areas are more likely to have sunshine than interior locations as the cooling effect of the nearby ocean suppresses the development of convective cloud. This distinction is often enhanced by the formation of sea breeze circulations which can bring a zone of clear skies along the waterfront to an otherwise cloudy day. The zone of clearing will extend inland at best for only a few kilometers depending on the precise nature of the onshore winds. 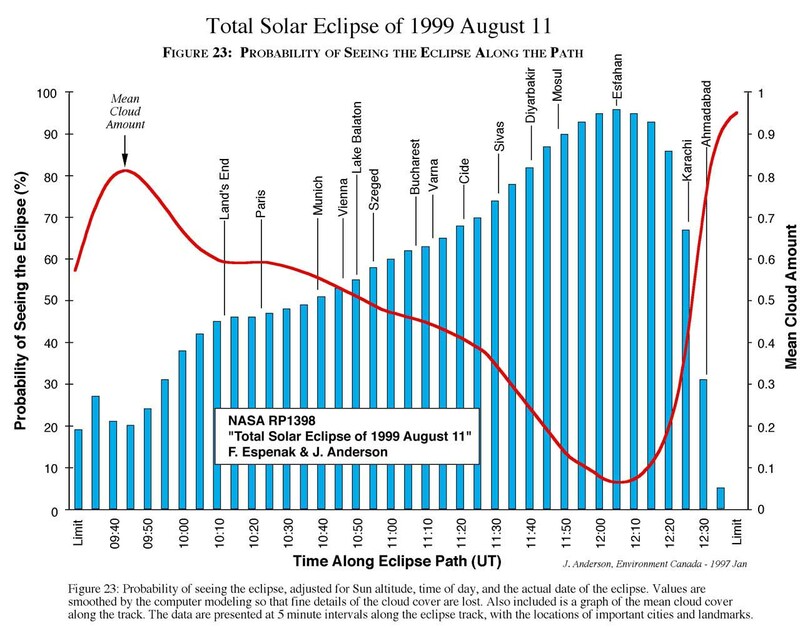 Realistically, however, climate statistics suggest that England is the least suitable land location from which to view the eclipse except for parts of India and Pakistan where monsoon cloudiness dominates. The satellite-derived climatology drawn in Figure 22 shows a mean cloud cover of 55 to 65% across southern England. Surface observations show an average of 5.8 to 6.5 days of the month with scattered cloud and good visibility, slightly lower than much of the rest of western Europe, but only a third of the cloud-free days available in Bulgaria and Romania, and a quarter to a fifth the number of days in the best locations in Turkey and Iran. This rather heavy cloudiness culminates in a meager 43% of the possible sunshine in England. Land's End and The Lizard are among the sunniest spots in the England thanks to the suppression of convective cloud by sea breezes and a slightly closer position to the semi-permanent anticyclone over the Azores. The effect of these two factors is minor but detectable and can be seen by comparing statistics for Plymouth and The Lizard in Table 38. Data collected at the former show a frequency of scattered cloud and good visibilities of 5.8 days per month; at The Lizard this statistic improves slightly to 6.5 days per month. Most climatological studies concede a five to ten percent increase in sunshine to the coastal sites over those inland, but much of this advantage is only realized during unstable convective days, such as those found behind a cold front. 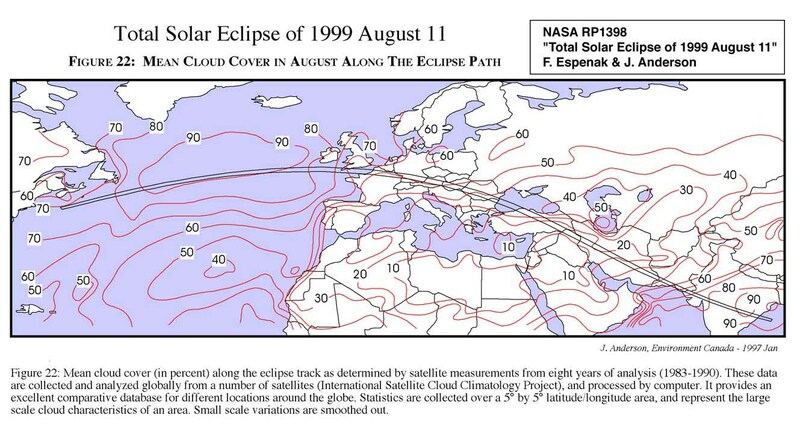 Figure 23 promises a stationary observer only a 45% chance of seeing the eclipse in southern England. Whatever the cause, low level stratiform clouds are the most likely type of cloud along the south coast (Warren et. al, 1986). These clouds are formed as warm maritime air approaches from the south and moves over the colder waters of the nearby English Channel. Such clouds typically cover three-quarters of the sky when present, making a clear patch difficult to find. The best location to find a gap in this kind of cloud cover is to seek shelter against the southerly flow behind the low range of hills which define the spine of Cornwall so that low level winds are flowing downhill and drying the air. The hills near the center line between Penzance and The Lizard do not accord much protection, in part because they are not quite oriented to lie across the likely direction of the wind. In the event of a heavy layer of low cloud, the eclipse watcher is best advised to sacrifice some of the duration of the eclipse and head northeast along the highway toward Bodmin, leaving the center line behind. It's a small chance, but the best that can be offered under the circumstances.